This beautiful material is the most realistic imitation stone on the market today. It is available in full size Blocks, cut slabs, shaped Handles and Inlays. 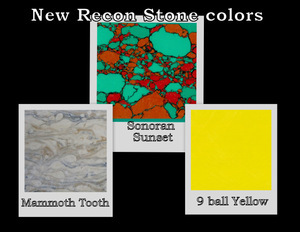 Recon Stone is produced from approximately 85% natural stone ore. The ore is pigmented, compressed into blocks and impregnated with approximately 15% acrylic gem resin. 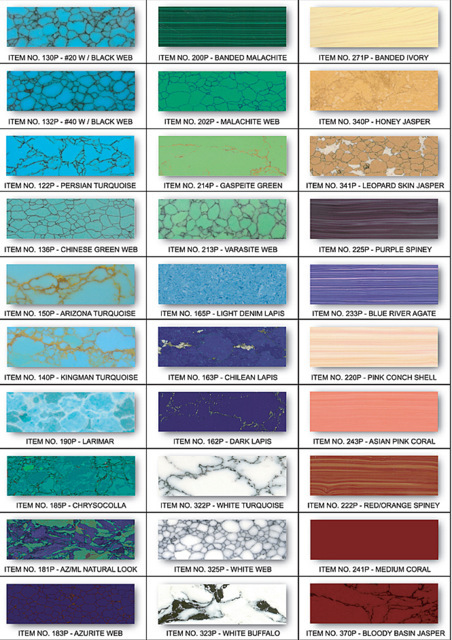 We offer Recon Stone slabs in 4 different thicknesses, 1/8", 3/16", 1/4" and 3/8". Pricing will be based on weight at $4.00 per ounce. All blocks vary in density, width, and length. The average block size is 2-3" wide x 11" long. The cost will be calculated when the slab is ordered and has been cut from the master block and weighed so please know that the amount that appears in your cart will not match your actual in cart price and could be higher or lower on your actual invoice as we will not know the exact cost until material has been cut and weighed for your specific order. Please click on picture to expand.